Available exclusively from the Natural Spa Factory, the launch of sauna tents guarantees a heat wave, whatever the weather! Designed by the specialist company that supplies the arctic army, these sauna tents are perfect for heating up outdoor spa areas at health and leisure resorts and wellbeing retreats. In addition, sauna tents make the perfect accompaniment to any party, event or seasonal occasion. Easy and quick to set up, no planning permission is required, already putting them first in line to make the ideal spa treat at this summer season’s hottest festivals and ‘glamping’ sites! 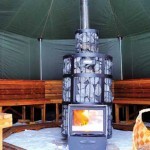 The octagonal shaped sauna tents measure 5m by 5m, seating 15 to 20 people comfortably. This unique spa experience is simple to use. Just light the central log fire, which takes 45 minutes to heat up, and its ready for guests to enjoy. Emma Webber, co-founder of The Natural Spa Factory says: “We are always on the look out for the latest innovations in spa products and treatments and believe the Sauna Tents are the perfect addition to the UK spa industry. The Natural Spa Factory is a wholesale emporium of high quality natural products for the spa and beauty industry with a first class service to match. Products are, where possible, as natural as can be, often sourced and handmade in the UK, niche, unusual, often exclusive and competitively priced.